Frankincense Sage – Essex County Naturals. Subtle and mysterious our exotic floral blend of African Frankincense and Russian Clary Sage essential oils will capture your imagination and your heart with its delicate whispers. 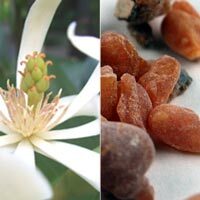 TIP: Combine a matching soap, bubbling bath melt, skin butter, mineral body salt, body scrub and room fragrance in the same aroma to create your own Magnolia Frankincense scent line.